C/O Ashar Sports Management in 57 days and signed 2/2 and included a signed card. Very nice success from the 4-time olympic gold medelist. She is arguably one of the better female track athletes of all-time, at least in recent memory. I really like getting these 2012 Topps Olympic cards signed, they always turn out really nice. She was also nice enough to include a signed postcard kind of thing with all of her accompishments which is awesome. I hope to get more of these olympic cards signed in the future. 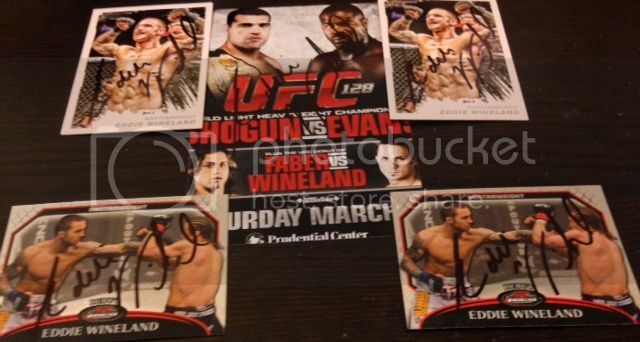 C/O Home in 40 days and signeed 3/3 and included 4 signed cards! What is there to say about the kind of guy Pat Neshek is when it comes to this hobby, he is simply the best! 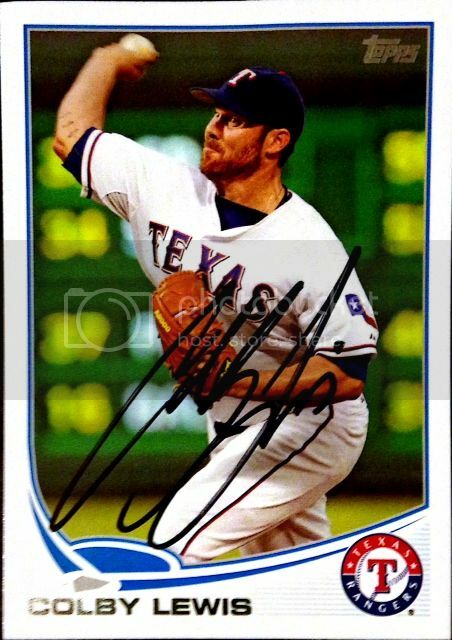 I included a couple of lower end signed cards and Mr. Neshek included 4 signed cards of himself. I hope that he can make it with the Cardinals as a reliver this season. This is a nice add to my 2013 Topps set from one of the best TTM signers in baseball. Nice success from the Brewers left field hopeful this season. He a pretty good season last year in limited work with 11 HR's with a .278 avg. He already has 1 HR this spring to go along with a .278 avg. He should be a good player in the future. This took a while but they all came back really nicely signed in gold pen. Very nice add to my 2011 Topps Heritage Minors set. I have read that he isnt real easy to get IP so the fact that I could get him TTM is awesome. I was really hoping to get this one back because I think Gallo is going to be a very good player for the Rangers in the future. He won the Joe Bauman Home Run Award for hitting the most HR's in a minor league season in 2013 with 40 HR's. He did that while still maintaining a respectable .251 avg. If he can produce those kind of power numbers while still having a decent avg he will be a very good-great player going forward. He was ranked the #60th best prospect after the 3013 season according to baseball america. I really like the look of these 2011 Topps USA cards and Im planning on sending the same card to Michael Wacha very soon. Awesome success from one of the best players in MLB history, steroids or not. He is a member of the 500 HR club and 3,000 hit club and is only the 4th player to be a member of both. He was also a very good defensive player winning the gold glove 3 times over his career. He most likely will never make the Hall of Fame but he was a very good-great player during his career. I was very happy to see that he signed all 5 cards and all of the turned out great. I would love to possibly get Tejada on the dual at some point. 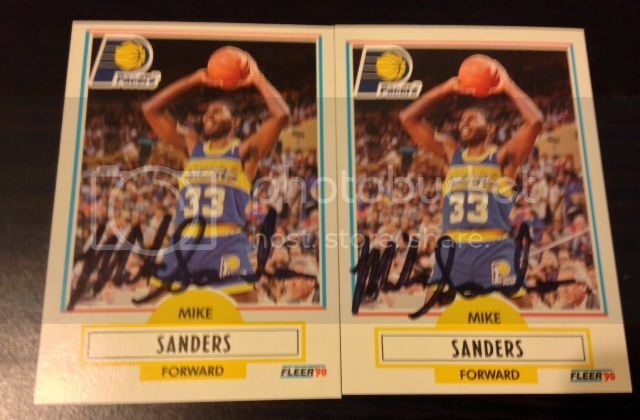 Again like Edwards, Sanders was an underrated player during his career and has a had a long coaching career in th NBA. Another nice add to my 1990-91 fleer set and im starting to run out of people who still sign TTM well. I really enjoyed watching Mccallum play at Detroit in college, he was the Horizon League player of the year in 2013 and ended up getting drafted by the Kings in the 2nd round. He has bounced between the D-League and the Kings multiple times this season and I hope he can stick with the Kings in the future. It was a suprise seeing one of these 13-14 rc's come back, I sent about 15 of them at the beginning of the season and have only gotten 2 back so far. 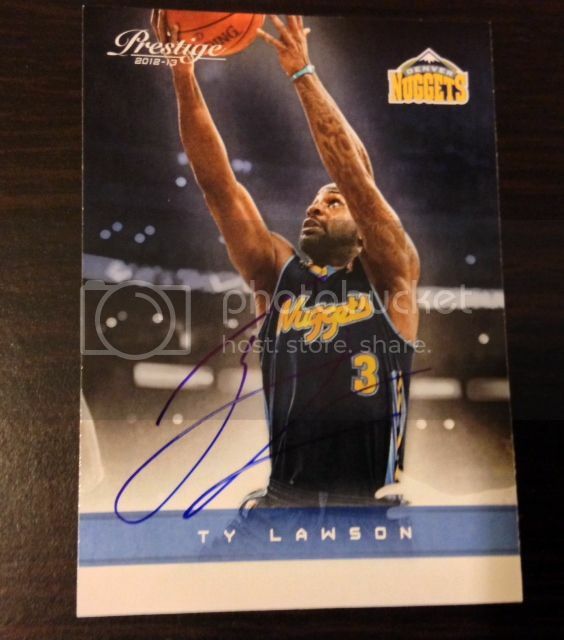 Awesome success from the Nuggets starting PG. I have enjoyed watching Lawson ever since his days at North Carolina. He has really had a solid season with 18 PPG and 9 assists this season. This one took awhile to get back and I have seen returns from Lawson where he signed on the back that was an obvious stamp, but I think this one is legit. Really happy about this return. 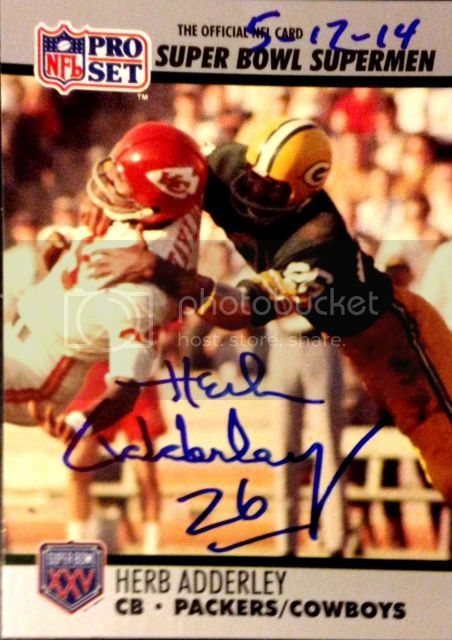 Whenever I can add signed Packer cards TTM Im happy. Coffman is still to this day one of the best TE's in Packers history. He was a 3-time pro bowl selection and was inducted into the Packers Hall of Fame in 1994. He was nice enough to inscribe a different bible verse on each of the cards. This is anice add to my Packers collection. Awesome unexpected success from an up and coming Packers DB. I havent seen anyone else get Hyde back TTM so Im extremely happy to get these photos back. I wish he had cards I could have sent but dosent have any out right now. He should be a big contributer at CB for the Packers next season and might even move to safety. He should also be the starting PR next season as well. 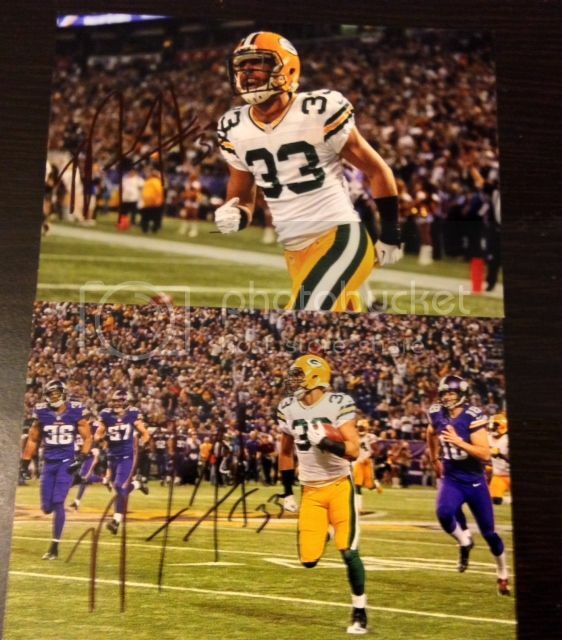 I sent out to a couple of other young Packer players and I hope I can get those in sometime in the future. a rare 2005 Topps All-American return. Im very happy to get this one back. He was one of the rare players to play all three sports(football, basketaball, baseball) at either the college or pro level. He is considered one of the best all-around athletes of in the last quarter century. I have kind of hit a wall in the 2005 Topps All-American set, alot of the players in the set either require a fee or dont sign at all. 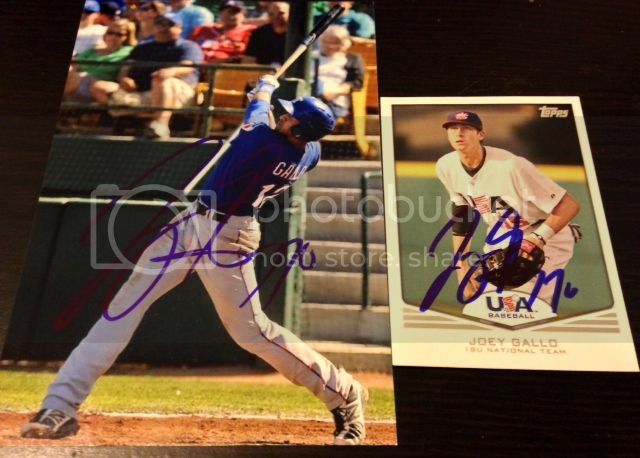 C/O Home in 51 days and signed 3/3 and included 2 signed 8x10's! This is one of my favorite successes. 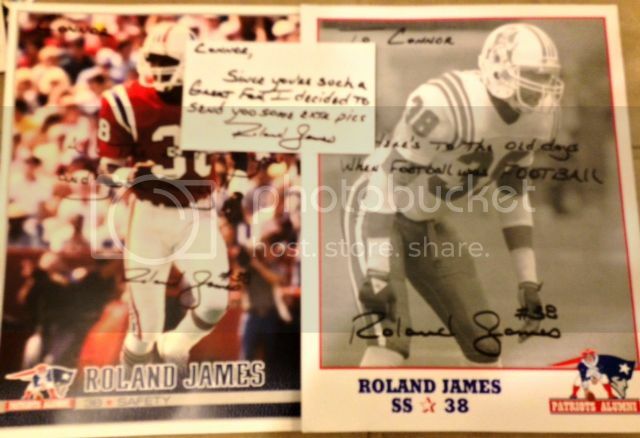 My Mom grew up in Boston so I do follow the Patriots to some extent so I was so excited when he used his own postage and included 2 signed 8X10's with cool inscripitions. He really didnt have to do that and they are greatly appreciated! 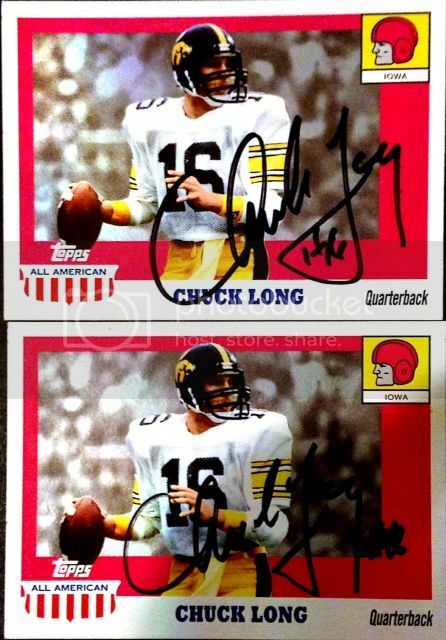 Another great add to my 2005 Topps All-American set, he was nice enough to inscribe "All-American 1979" on the cards and different inscripitions on the 4x6 photo and 2 8x10's. I wish all players were this cool and Mr. James is a class act. Awesome success from in my opinion the best defensive player in the NFL. I was a HUGE fan of Watt when he was at Wisconsin and actually sent to him before he really blew up in popularity. One thing that was kind of disappointing was that he has shortened his autograph, but still a very nice success regardless. I really like the look of the photo, it is perfect for getting and signed and looks really nice. Im really glad to finally get Watt on a card. One of the best recievers of the 90's and was largely overshadowed over the span of his career. He finally got inducted into the Hall of Fame this year and I think it was about time he got in. 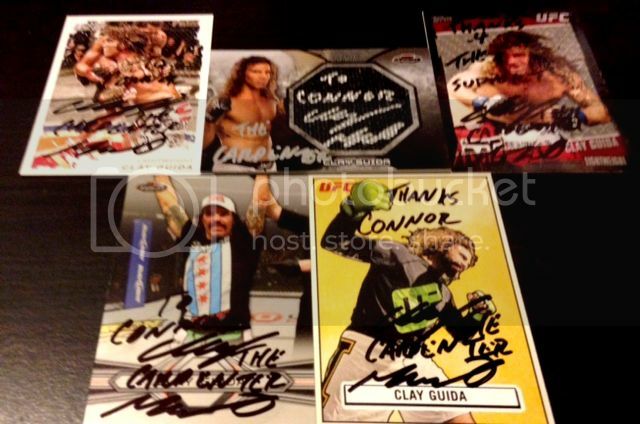 I was very happy to see that he signed all 4 cards and they all look great in blue sharpie. I might end up getting one or two of them certified in the future. One of my best successes to date. 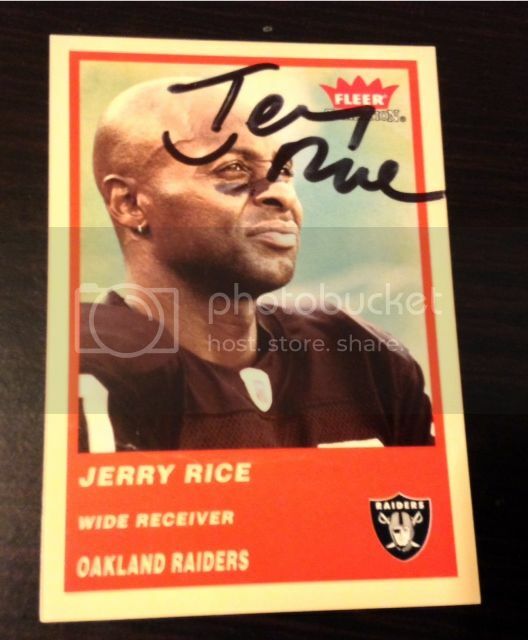 One thing I thought was interesting was that I sent both a Raiders card and 49ers card and I had the 49ers card in front of the Raiders card and he decided to sign the Raiders card. 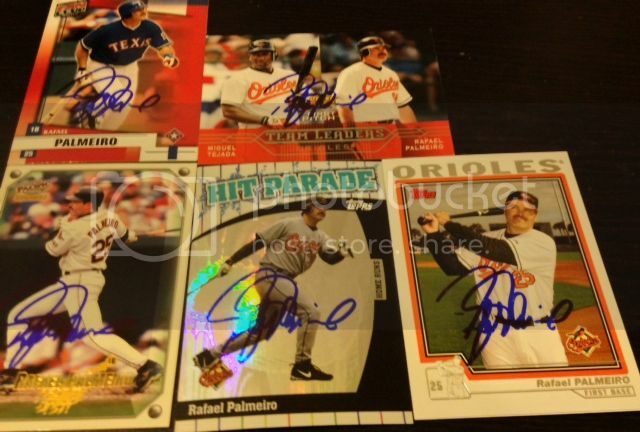 The Fleer Tradition cards look great signed though, and Im super excited to get this back. nothing needs to be said about Rice's NFL career, he is the GOAT at WR. I might send an 8x10 in the future. Cool success from one of the better wingers in the NHL. He has had abit of an interesting career on and of the ice. He won the calder cup as the best rookie in the NHL in 2002 and has a decorated international career. 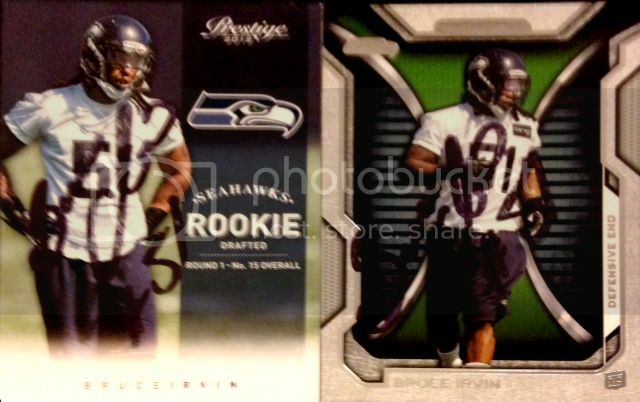 This is a very nice add to my 11-12 UD set. Very cool success from the Flyers Goalie. I enjoyed watching Mason play in Columbus and happy to see that he is having success in Philadelphia. 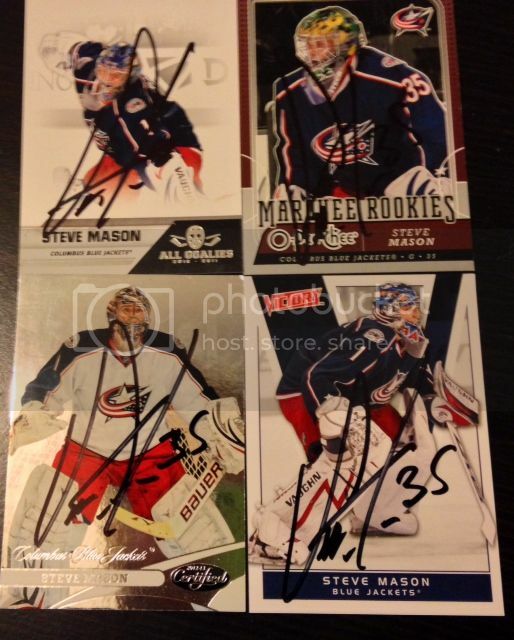 I really like the look of the All-Goalies set and they look really nice signed. It was interesting that he put number 35 on the cards in which he was pictured wearing number 1. You dont see that much TTM as opposed to IP where the player put his current number where he is wearing the old number. Stilla very nice success and if anyone happens to have a 11-12 UD Mason signed I would be willing to trade any of them for that one. This is one of my longest returns to date, but also one of my favorites. Im a big fan of Big Joe and would like to see him win a Stanley Cup with the Sharks in the future. I really like the way Thornton plays, using his size to his advantage. He is still one of the best centers in the NHL and looks like he will keep it up for a couple of more years going forward. Another great 11-12 UD add to my set. Nice success from the Hurricanes Right Winger. I really enjoyed watching him play in Washington with Ovechkin with the Russian Connection. Semin is alot of fun to watch when he plays hard and motivated. He signed all 4 cards really nicely in blue sharpie. Again a really nice add to my 11-12 UD set, I have really been moving along nicely with that set and hope to get more in the future. 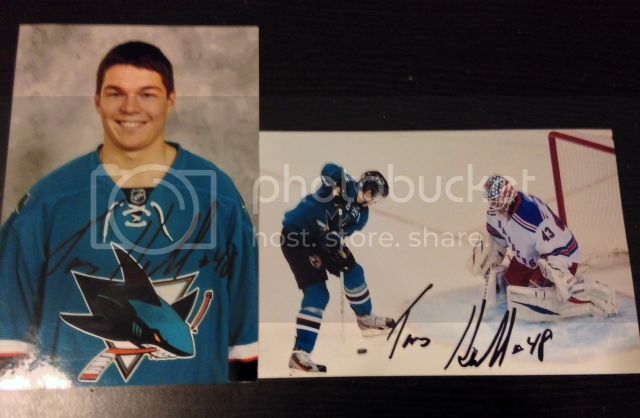 Awesome success from the exciting Sharks rookie. Unfortunatly, he got hurt and will be out for awhile, but I hope he can make a full recovery and continue to have success in the NHL. His popularity blew up when he had his 4 goal game vs the Rangers in which he became the youngest player to do that in NHL history. I really like the look of the photo on the left in which it pictures his 4 goal game. very cool success from the #4 ranked Bantamweight in the UFC and could be a contender for the championship in the future. He won his last fight against Yves Jabouin via TKO and I hope he can continue this trend going forward. Cool success from the #15 ranked Welterweight in the UFC and should be moving up the rankings. He won his last fight against decent opponent in TJ Waldburger. 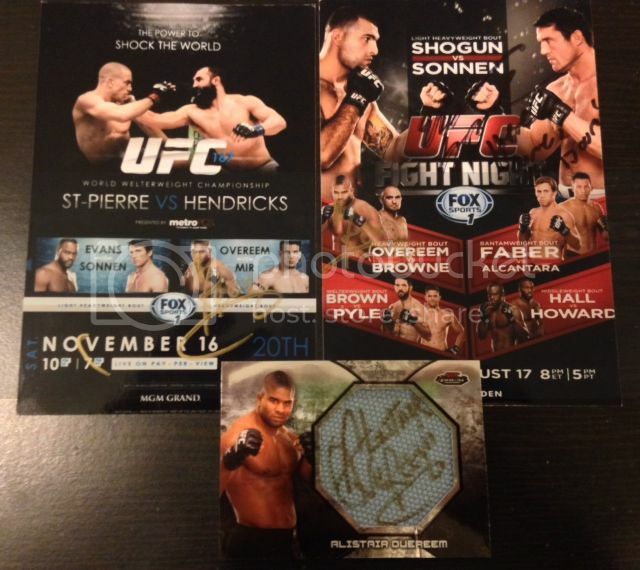 Very nice success from the #7 ranked Middleweight fighter in the UFC. 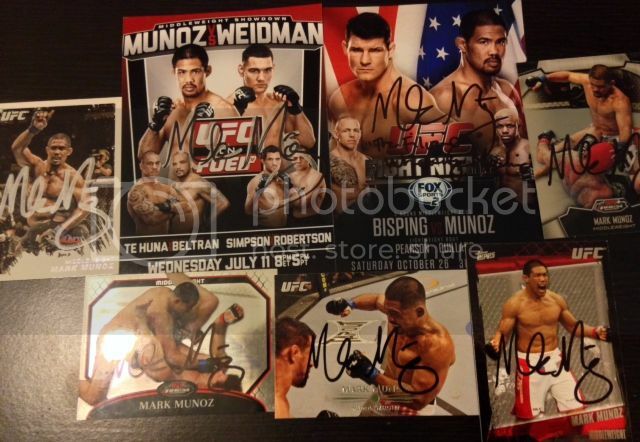 I really enjoy Munoz's style inside the octagon, he is a great wrestler. Unfortunatly, he pretty much got dominated by Machida in his last fight but I hope he can rebound and win his next fight. Very cool success from the #3 ranked Flyweight in the UFC and contender for the Title. 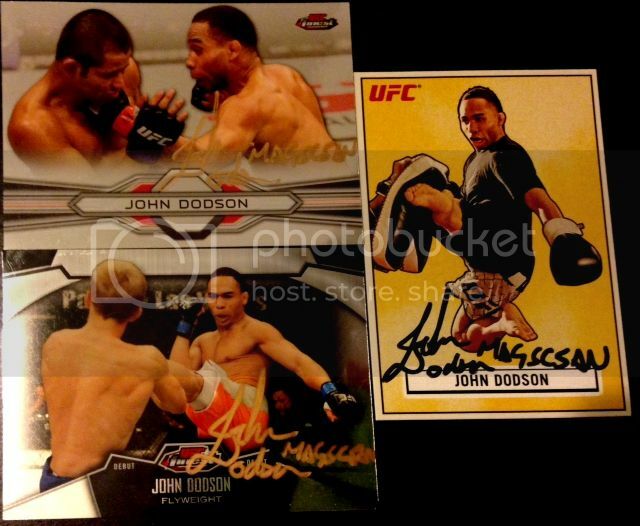 I really enjoy watching Dodson fight and I hope he can get a rematch against Mighty Mouse in the future. He did win his last fight against Darrell Montague and I hope he wins his next fight going forward. He was nice enough to incribe "Magician" which looks awesome on the cards as well as the photo. 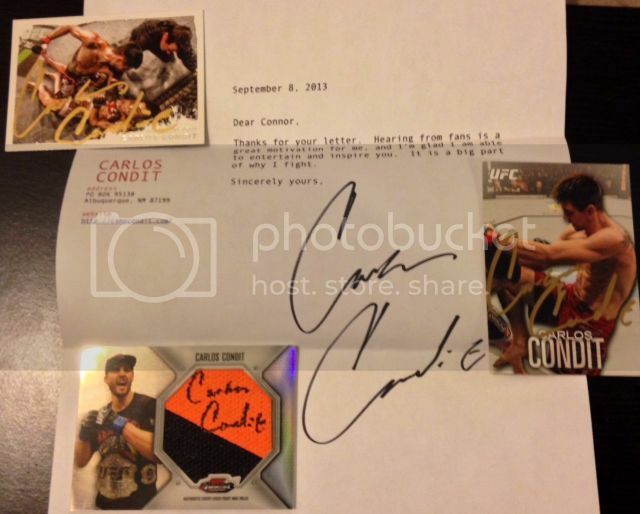 Awesome success from the #2 ranked Welterweight in the UFC. He has a big fight coming up against Tyron Woodley and whoever wins that fight should get a shot at the title. Condit is one of my favorite fghters and I would love to see him with the title someday. I was suprised to see that these were not personalized considering he usually does. 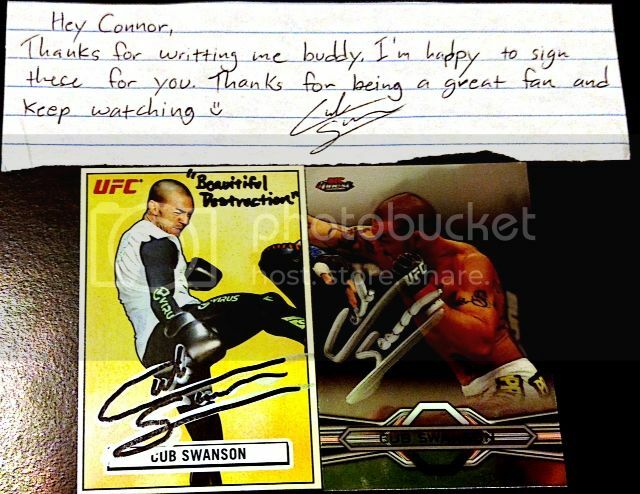 I am going to be sending to him soon to get a card for my Octagon Side set signed. Finally got Hendricks back, I have sent to him on 3 different occasions and finally got him back. Hendricks is the #1 ranked Welterweight in the UFC and has a fight against Robbie Lawler for the title. He was nice enough to inscribe "Bigg Rigg" on all 4 cards and signed the relic perfectly in silver. One of my favorite UFC returns to date. A rare Via Venue success from one of the tougher guys to get TTM. He actually posted a picture on twitter saying he was signing his fanmail and was holding my letter in the picture. He signed the mat relic perfectly with gold sharpie and actually used his sull signature instead of Reem that he signed on the photos. Very happy to get this back, but I wish I would have had just base 13 Finest to send to him at the time. 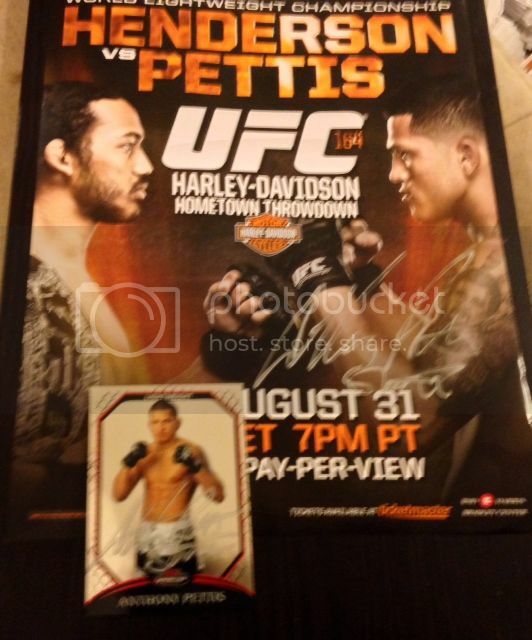 Awesome success from the UFC Lightweight champion. One of my favorite fighters and I hope he can hold the title for the foreseable future. This is also a rare 8X10 return and looks great. 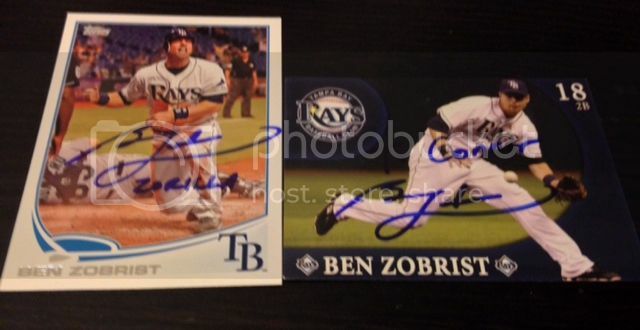 He was nice enough to inscribe both items with his nickname "showtime" and looks awesome. If there is anyway I could get Benson Henderson on this to finish it off that would be great.Im sorry for the blurry picture, I will retake a picture when I get a chance. Adam_HAWKey wrote: Those Hertl's are sick! Thanks, I wish I had a card or two I could have sent to him but the photos do look nice nonetheless. Very nice success from one of the most underrated players in the MLB. He can literally play every position besides catcher and pitcher at high level. He is a 2 time all-star and should make more in the next couple of years. This is a great add to my 2013 Topps set and I was really excited that he added his nickname "Zorilla" on the 2013 Topps card. 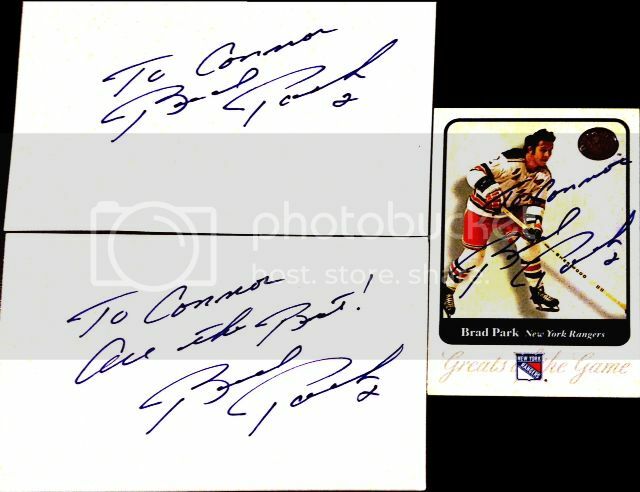 It was also really cool that he included a signed testimonial card. This is just a very nice overall success! One of my favorite as well as best successes to date. 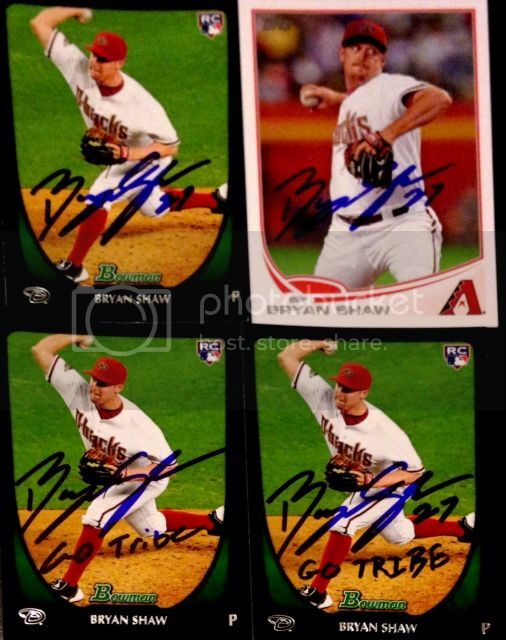 I know Kershaw has been a great signer but its still awesome that arguably the best pitcher in the MLB signs TTM. I was very excited that he signed both cards as I was expecting that he would only sign 1. I knocked out both cards of Kershaw in the 2013 Topps set with 1 TTM which is great! Wow those are some amazing returns! I love the Kershaw, Hertl, and Andre Reed autos! BackupGoalie wrote: Wow those are some amazing returns! 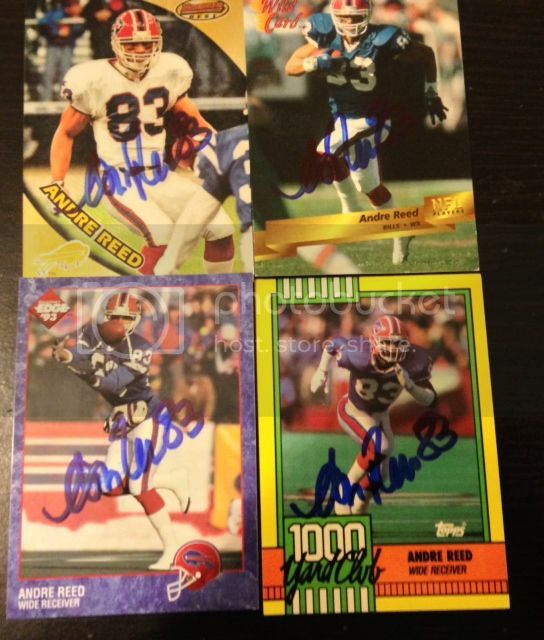 I love the Kershaw, Hertl, and Andre Reed autos! With UConn playing today I thought I would bump this thread up with an old TTM success of one of the best players left in the tournament. I love that Napier, looks like UConn is heading to the national championship! A rare 2012 Topps Olympic set addition. Always cool to get an olympian in my collection, especially a member of the iconic Fab 5 of the 2012 olympic gymnastics team. She was nice enough to inscribe both of the cards which look really nice. I hope that I can get more 2012 Topps Olympic cards in the future. Very nice addition to my 2013 Topps set. I was very happy to see that he was signing as I have heard he has been pretty hard to get in the past. he obviously had a ridiculous amount of hype coming to the US and played pretty well in Boston for a couple of years, but really didnt live up to the expectations. These are still very nice additions to my set and probably the only time I would be able to get him TTM. Really happy with this success as I think McCaffrey is one of the more underrated WR's and dosent really get the recognition he deserves. He had a pretty long successful career and won 3 super bowls over the span of his career with the Broncos. 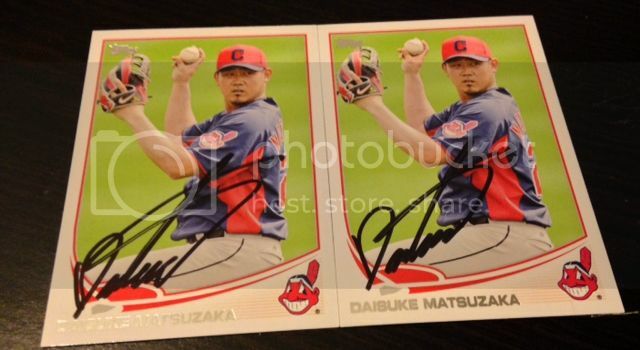 The cards look really nice signed and he has a pretty cool autograph. My second success from the greatest WR of all time. 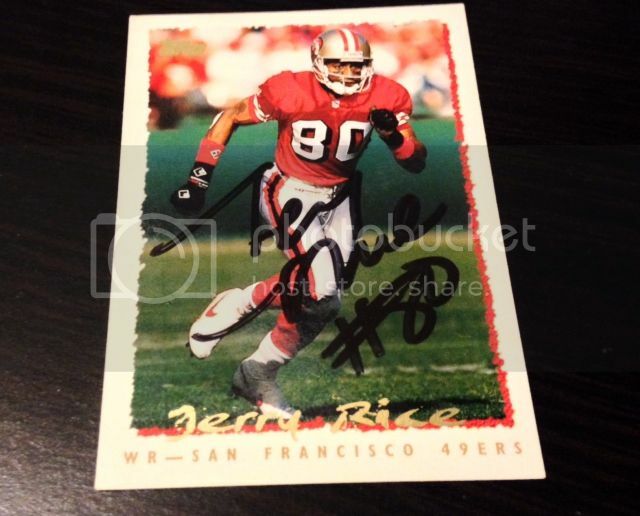 I wanted to get a card signed of him in his 49ers uniform and I am super pumped to get this one back! 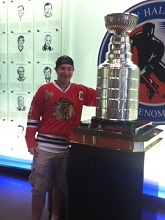 It looks great and I might get this one authenticated in the future. 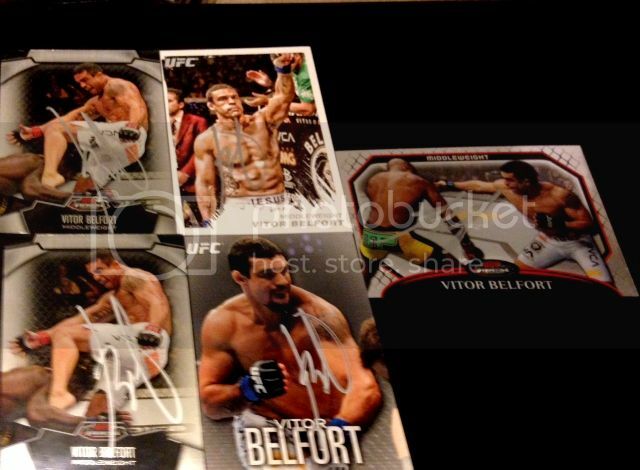 Cool success from a fighter that I have enjoyed watching for a long time and I am happy to get these back signed. He won his last fight against Cezar Ferreira in dominating fashion with a KO victory in 39 seconds. 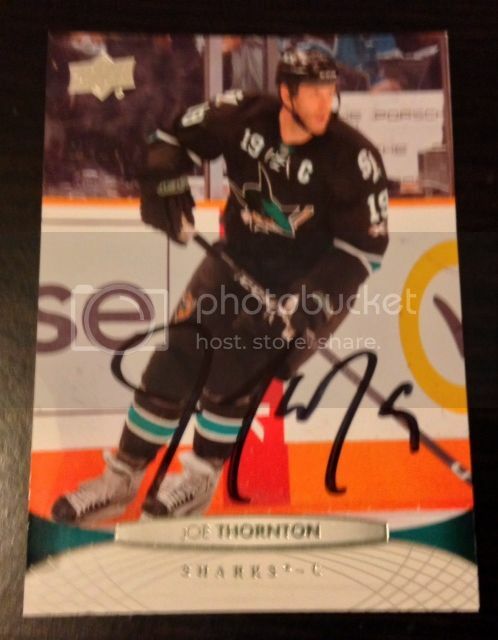 I really like the look of his autograph and they look really nice signed in silver. Very nice success from one of the up and coming Light Heavyweight fighters in the UFC. He has a Huge fight coming up against Jon Jones at UFC 172 for the title. Im working on this Octagon Side insert set, it has a lot of fighters that sign TTM and this is a great addition to that set. Cool success from the #6 ranked light heavyweight in the UFC. He had a pretty dominant win against Jake Shields and should get a shot at the title in the near future. He signed these beautifully in blue sharpie, I have seen some of his autographs not look that nice and all of these look awesome! another great addition to my Octagon Side set. These are two seperate returns, one took 119 days and the other took 33 days. He was nice enough to sign everything I sent both times. These are two great successes from a great lightweight fighter. 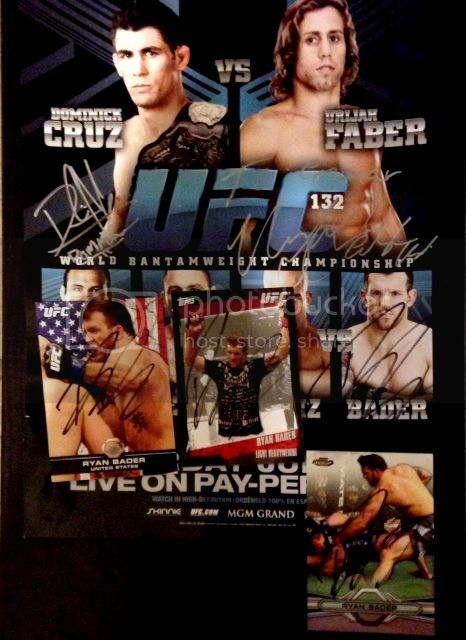 I hope that he can one day make a return to the octagon and get his title back, The poster is also signed by Urijah Faber and its going out to Ryan Bader soon. Again this is a great addition to my Octagon Side set. Awesome success from one of the biggest athletes in sports today! Extremely happy to get this back! The photo looks great signed in blue and signed in a perfect spot. Im sending to her again for my Octagon Side set soon so I hope I can get that back as well! 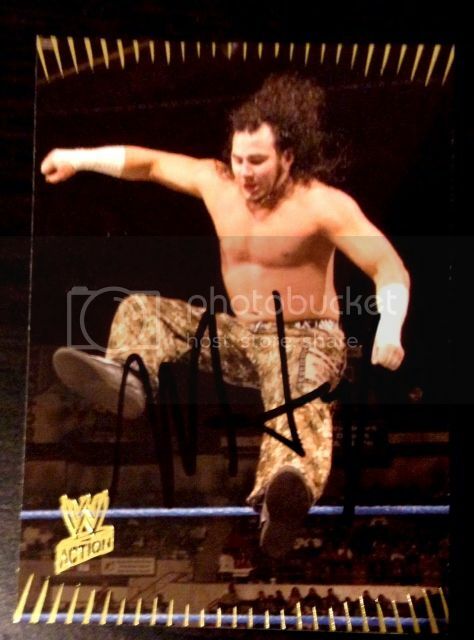 Very cool success from one half of arguably the best tag team in wrestling history in the Hardy Boyz. I enjoyed watching Hardy wrestle and his feud against Edge in the mid 2000's as well as his feud against MVP. He was always an underrated wrestler and never really got the recognition he deserved. I wish I had a better card of him to send but this is all I had at the time. I always like getting the WWE successes back but unfortunately alot of them really dont sign TTM. This was an unexpected return as it took a long time to get back to me. Shaw was involved in the Didi Gregourious trade and should be a valuable reliever in Cleveland. 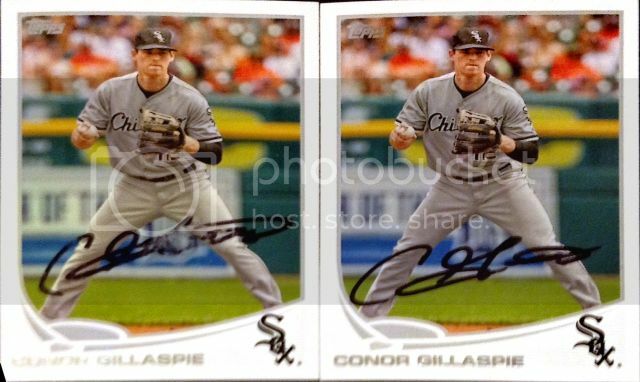 This is a nice 2013 Topps set addition and he was nice enough to inscribe GO TRIBE on 2 of the bowman rookies which is very cool, I always appreciate the inscriptions. Awesome success from the White Sox 2B. As a White Sox fan I always like getting these back. This is a rare Spring Training return, I have had a pretty back success rate from spring training. I have always enjoyed watching Beckham play, but unfortunately he got hurt and will be out about 6-8 weeks. Another nice 2013 Topps set addition which is getting added to every day it seems. Very cool success from the young Jazz center. He was drafted 3rd overall in the 2011 NBA draft and has been steadily improving every year. Unfortunately, he used a dried up sharpie that dosent look to bad on the prestige rookies but you really can barely see them on the hoops. I hope that he can continue to get better and eventually make an all-star team or two in the future. Nice success from LW in the NHL. I have enjoyed watching Staal play for awhile now, I do wish that Staal would have stayed in Pittsburgh but I can see why he wanted to play in Carolina with his 2 brothers. This is a very nice success for my 11-12 UD set which I havent had in awhile. 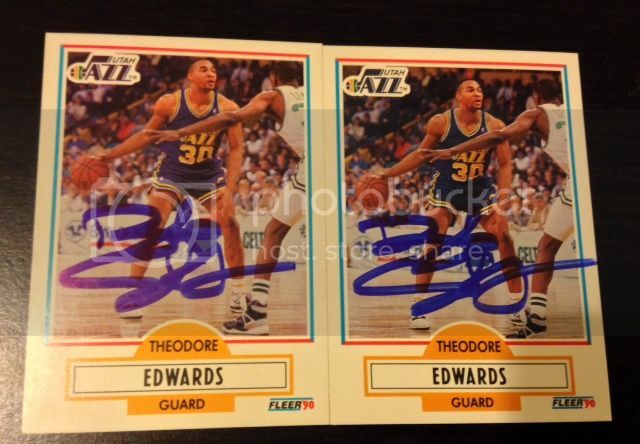 Finally, after sending to Evans on 3 seperate occasions I got him on 2 cards which looks awesome. 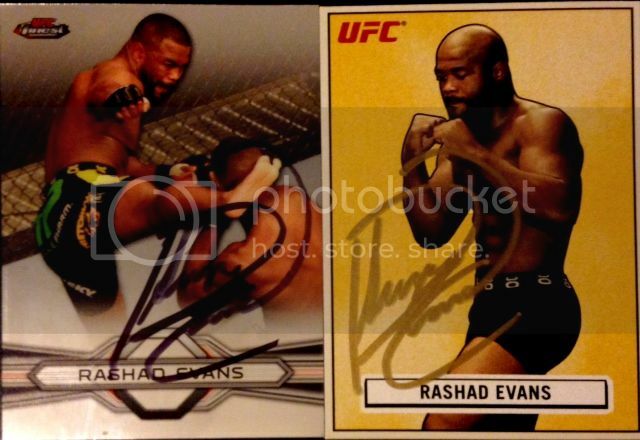 I have enjoyed watching Evans fight ever since his KO victory against Chuck Liddell in 2008. Its a shame he got hurt just 10 days before his fight against Daniel Cormier as i think that would have been a great fight to watch. I hope that he can make a succesful return to the octagon and eventually get a shot at the Light Heavyweight title. This is a great addition to my Octagon Side set and looks awesome in the gold pen. By the way I have started using CamScanner to take pictures of my successes. I think the app is really cool and I think they do look better. Let me know what you think about CamScanner and about any of my successes in general. A little bit of dry spell lately but had one great success today! I really hope these are legit because if they are it's one of the best successes I have gotten to date. 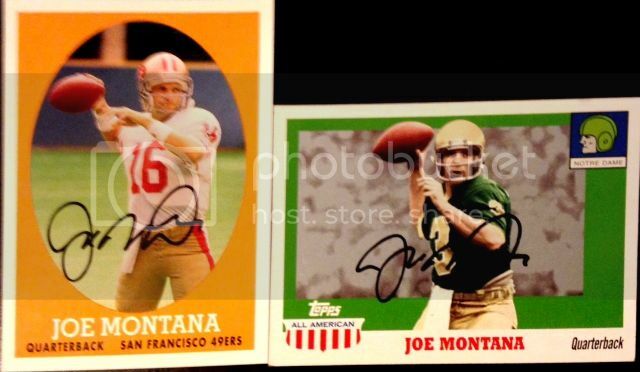 Obviously there isn't much I can say about Joe Montana that everyone dosent know, he is arguably the greatest QB of all time and I'm super excited to get these back! This is an awesome success for my 2005 Topps All-American set and like I said one of the best TTM successes I have ever gotten if they are indeed legit. Very nice success from the now retired UFC fighter. He fought for a long time and fought a lot of the legends of the sport. He had in my opinion the greatest upset of all time when he knocked out Georges St-Pierre in the 1st round at UFC 169. The gold pen he used looks really nice on all of the things he signed. 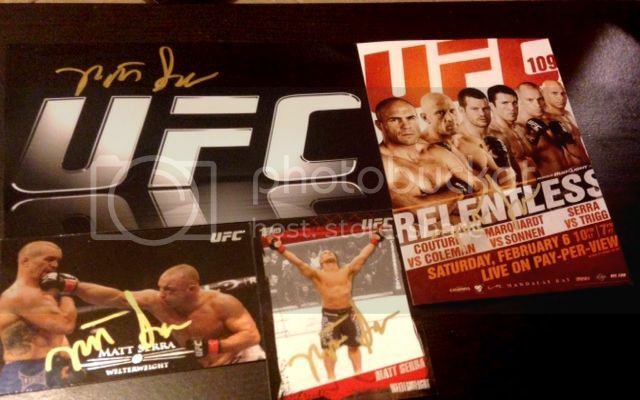 Nice success from the UFC Welterweight Rick "The Horror" Story. He has been having alittle bit of an up and down career in the UFC. He unfortunately lost his last fight against TUF winner Kevin Gastelum. I hope he can rebound and win his next fight. He was nice enough to sign 6 things for me in a nice silver sharpie and nicely inscribed his nickname on all off them. I needed the Moment of Truth for my set. Always cool to get an AP college coach of the year award winner through the mail for free. 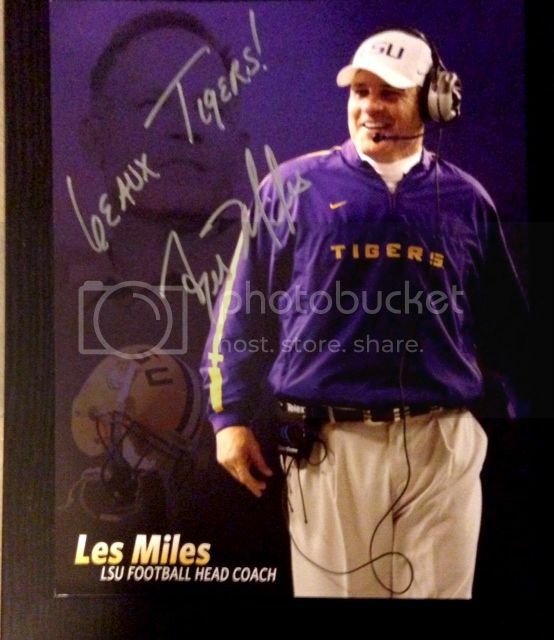 The photo is very nice and he signed it nicely in silver and added GEAUX Tigers which is really nice. Awesome return from one of my favorite coaches in college basketball. 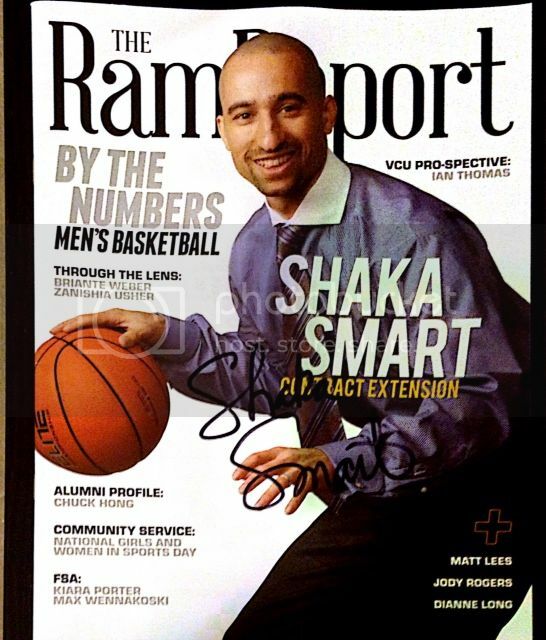 I always like watching that VCU team play, and I still wish that Smart would have taken the job at the University of Illinois as an Illini fan. It was very nice of them to send a signed magazine and they had to pay around $3 postage to get it to me which I really appreciate! very nice success from the veteran Starting Pitcher. He has a long career playing both both in Japan and in America. He has had a bit of a down year going 3-3 with a 5.40 ERA and bouncing between triple-A and the Majors. This is a very nice addtion to my 2013 Topps set as well as the blowout TTM league. Cool success from a relief pitcher of my favorite team. Unfortuntely, he got hurt and had to be placed on the 60 day DL. I hope that he can make a successful comeback and be a valuable part of the bullpen rotation going forward. This is a nice add to my 2013 Topps set as well as the blowout TTM Challenge. I really enjoy watching Mr. Gillaspie play and was really excited to get him back. He always plays hard and plays the game the right way. He has had a really good season with a .347 AVG. He has locked down the 3B spot as well with great defensive play. Another nice add to my 2013 Topps set as well as the blowout TTM Challenge. One of those guys that you need to complete a set. 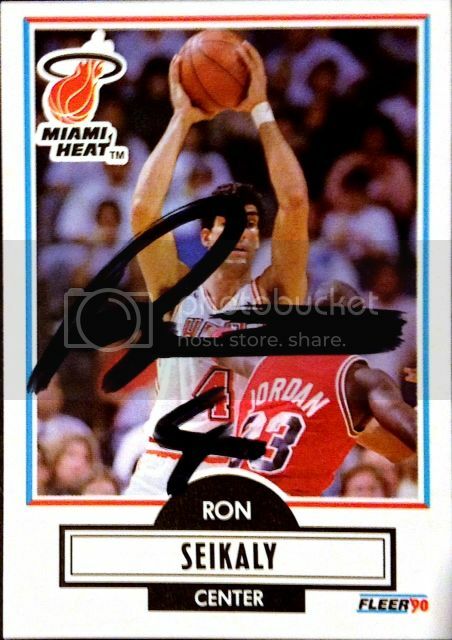 He was really underrated and one of the Miami Heats first great players. He also won a gold medal in 1986. Terrible autograph but what can you do. I needed him for my 1990 Fleer set. 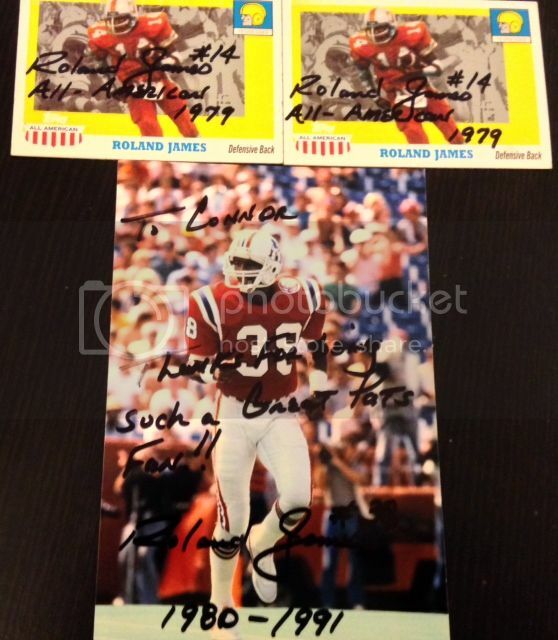 Very nice success from the 1999 College Football Hall of Fame inductee. He had a great college career at Iowa winning multiple awards and also being inducted into the Iowa Sports Hall of Fame in 2001. Unfortunately, he didnt succeed as much in the NFL as he did in college. 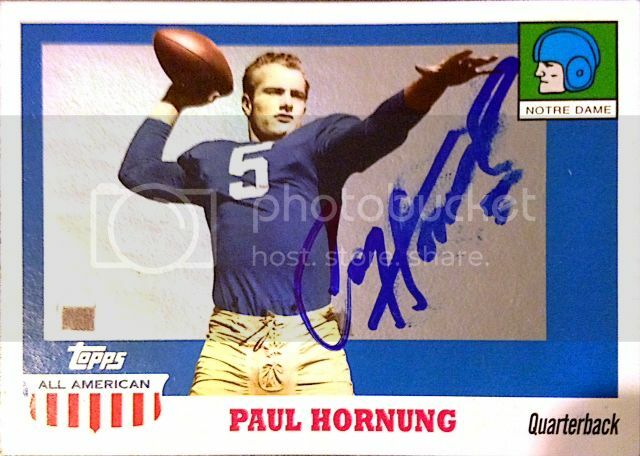 This is a nice add to my 2005 Topps All-American set. I was very excited to get this one back. I love getting the Packer returns and he is one of the best of all-time. He sometimes does require a fee but I was happy to see taht he signed one for me for free. He is one of the most decorated football players of all-time both college and NFL. The autograph did get smudged alittle but but not to bad. This is an awesome addition to my 2005 Topps All-American set which I was in a bit of a drought getting them back but was happy to get a couple back. Another great Packers success and Pro Football Hall of Member. 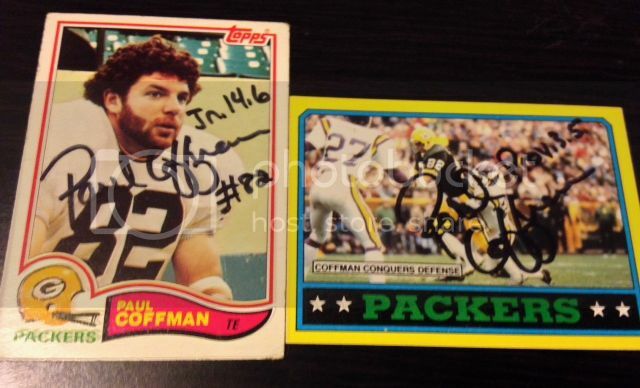 I always love getting these old Packers players TTM and getting 2 of the best is awesome. He is another guy that sometimes requires a fee and him signing a card for me for free was greatly appreciated! I really like this 1990 pro set Packers set but a lot of the guys in these dont sign for free if at all otherwise I would have considered doing the set. Did not expect to get this one back. Really happy I did though as I enjoy watching him play and he is a great pass rusher when he is on the field. I actually got him while he was at West Virginia but I wanted him on a couple of cards and Im happy to see that he still signs. The signatures didnt turn out great but Im just happy to get them back signed at all. Awesome success from in my opinion the best QB in the 2014 draft class. I was really happy to see him go #3 to Jacksonville and happy that they drafted WR's to put around him. I got these after the draft so I didnt know if he would still sign and happy that he did. 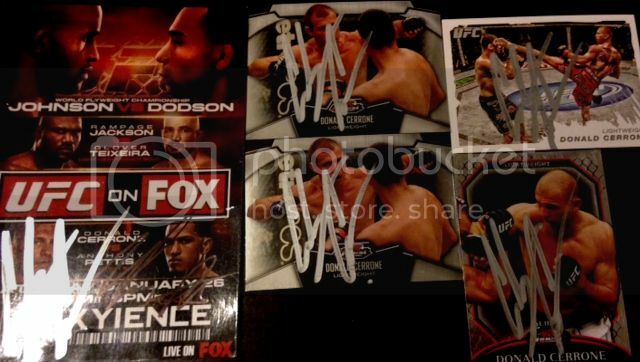 I really the look of the 2014 UD card and this card look really nice signed. Great return from a player with a whole lot of potential in the NFL. Cool success from a player that I have enjoyed watching for awhile now. He had a very good 13-14 season with 25 goals and 35 assists. Colorado is a team on the rise and Stastny should play a big part of that going forward. This is very nice addition to my 11-12 UD set. The first of hopefully many of the new set that im working on, the 2001 Great of the Game hockey set. The cards look great signed. 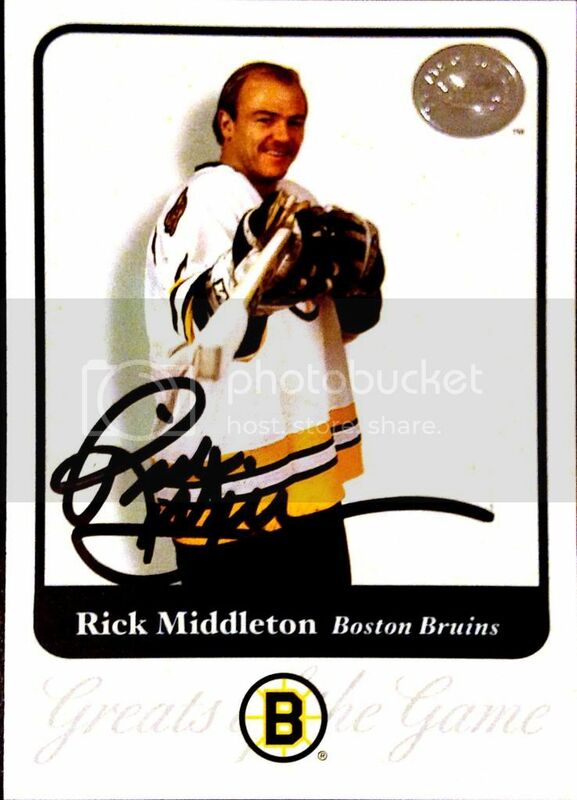 Middleton was a great player for Boston in his day winning the Lady Byng Trophy along with 51 goals in the 81-82 season aslo making 3 NHL All-Star teams. One of the best players in Flyers history. 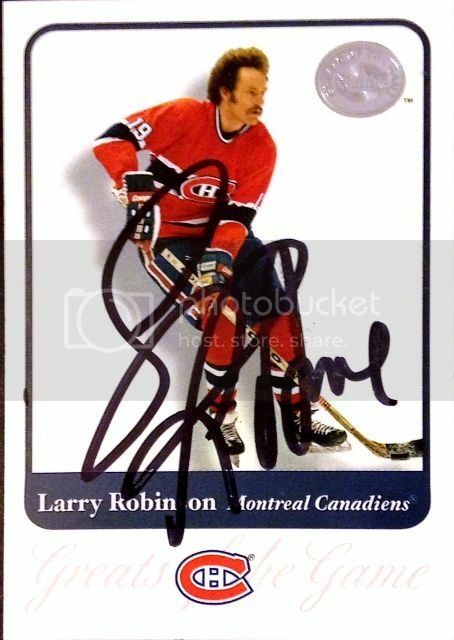 He had a decorated career winning 2 stanley cups and having an 100 point season in 72-72. Another great addition the 2001 Great of the Game set. Very happy about this success, one of the best in NHL history. 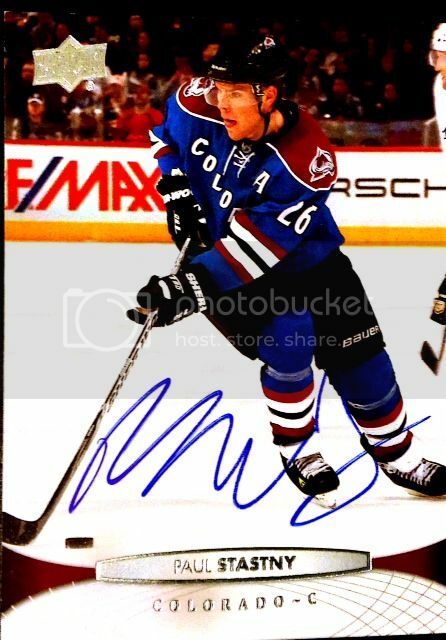 He had a great career in the NHL, he was inducted in the Hockey Hall of Fame in in 1998, he was ranked 24th out of the 100 greatest players in NHL history bu the Hockey news, and his jersey number 19 was retired in in 2007. I saw some people were getting there items returned unsigned recently so Im really happy that I was able to get him for my set. Great success from arguably the best defensemen to ever play the game, its either him or Bobby Orr. Another player that had an awesome NHL career, being inducted into the Hockey Hall of Fame in 1988 on the first ballot. 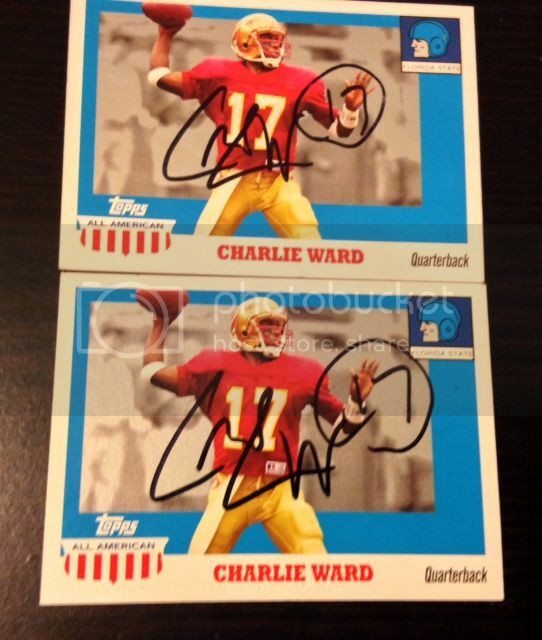 His autograph looks awesome on these cards and I hope that I can get many more in the future. This is my 3rd and probably last request to Faber for awhile. 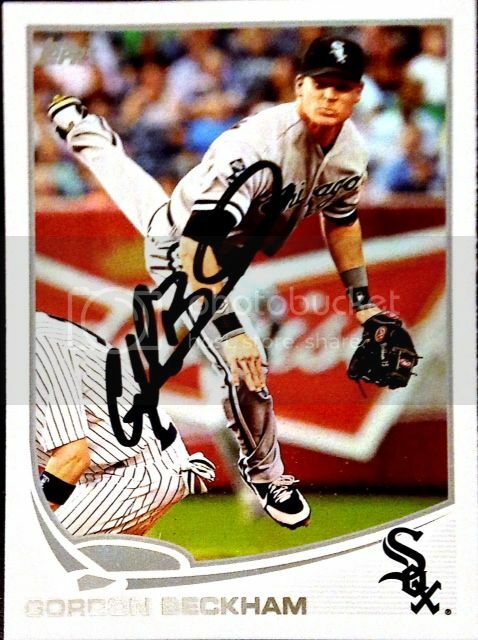 He is a great signer and his autograph always looks nice. Unfortunately, he lost his lost his last fight against Barao for the title. I hope that he can one day win the title, he is great fighter as well as a great person and deserves to win the title at least once in his career. 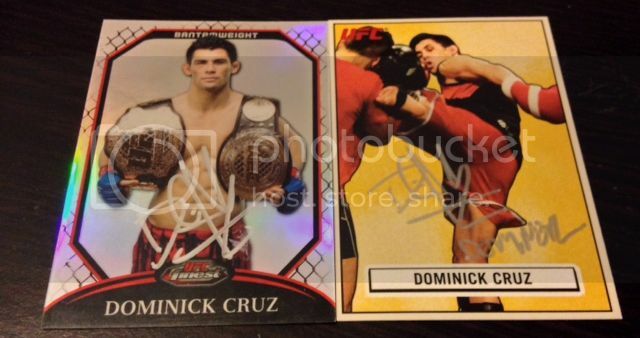 A great add to my Octagon Side set, I also really like to look of the valor card as well. 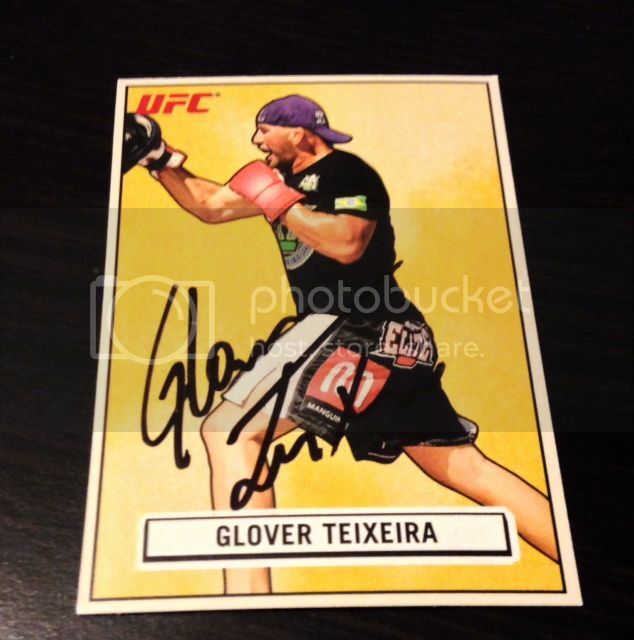 Like Faber, Guida is one of the best signers in the UFC. Anything you send to him he is nice enough to sign and again like Faber this will probably be my last request to him for awhile. His fight against Kawajiri was great and deserved to win Fight of the Night. I really like how he used the silver on the jumbo relic and it looks awesome and was also nice enough to inscribe The Carpenter on all of the cards which is appreciated. Another add to my Octagon Side set. Cool success from the flyweight title contender. He is expected to fight John Moraga at UFC Fight Night for the #1 contender. I would like to see him fight Demetrious Johnson again for the title in the future. He was nice enough to inscribe The Magician on all of the cards which is appreciated. Another nice add to my Octagon Side set. First time getting her autograph TTM. I respect anyone that represents out country in the military and being able to do that and then transition to being an MMA fighter is remarkable. Unfortunately, she lost her last fight against Miesha Tate and I hope she can rebound and win her next fight. She was nice enough to inscribe "Girl-Rilla" on the photo which is really cool. That photo will be going out to Demetrious Johnson soon because of some reason I can seem to get him on the octagon side set. Happy to get the bloodlines base back from Liz Carmouche as I dont think I had any signed up until this point. Finally got a return from Mr. Cerrone after 3 attemps. I have enjoyed watching him fight for awhile now and really excited to finally get him back. He wrote on the back of the return envelope sorry for the delay which is cool of him. 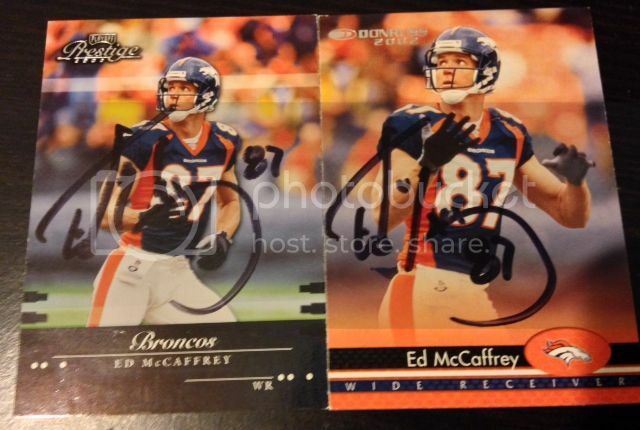 The silver sharpie he used on the cards look awesome! His last submission victory against Edson Barboza was very nice and his next fight against Jim Miller should be fun to watch. One of my favorite fighters right now, has a ton of potential and will be a champion one day. His last TKO victory was great against Dennis Siver and deserved to win Fight of the Night. He was nice enough to write a nice note which whenever any athlete does that it makes me even more of a fan. This is an awesome add to me octagon side set and even inscribed "Beautiful Destruction" which is awesome. He must have not liked how it looked in silver so he re signed it in black. My second return from her and it didnt take nearly as long. I might send to her one more time to get a 2013 finest signed. Im looking forward to here next fight against Alexis Davis at UFC 175. I really dont think Davis is ready for this caliber of fight but we will see. 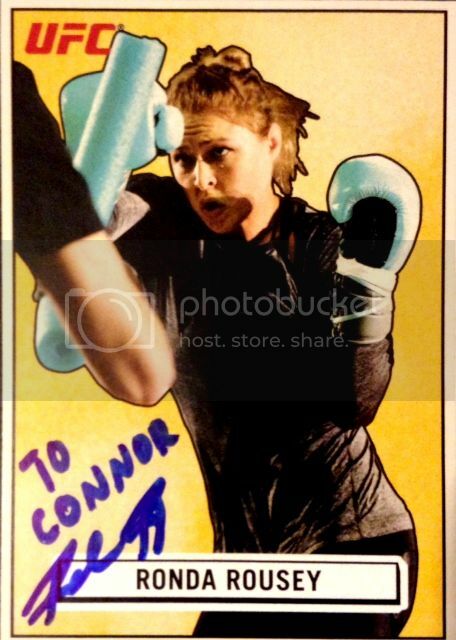 As mentioned on my other Rousey success someone else personalizes the cards before she signs them and she is a strict 1 per request. 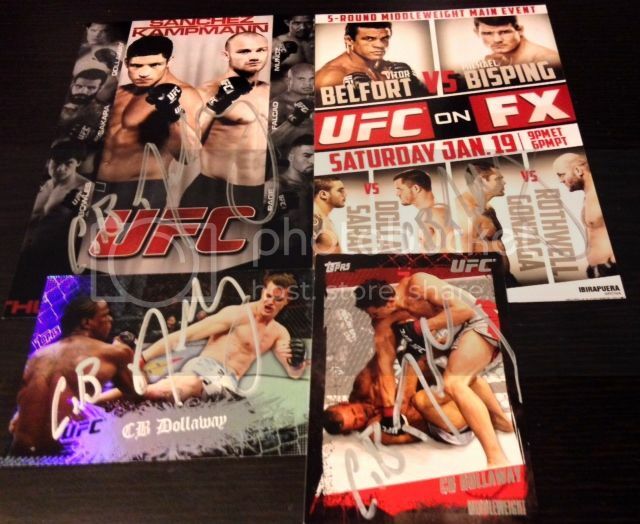 Another awesome Octagon Side card signed, this set is coming along nicely. Its only a 25 card set and I have 8 so far. One of the more suprising returns I have gotten UFC wise in sometime. Didnt truly think I would get these back but just took a chance. The KO victory over Dan Henderson was awesome, and I know I didnt think he would knock him out. I wish he wouldnt have pulled out of the Weidman fight, that would have been so much fun to watch. I hope that he gets another titleshot sometime in the future. I needed him for my Moment of Truth set. This is my 3rd and probably last request for a while. 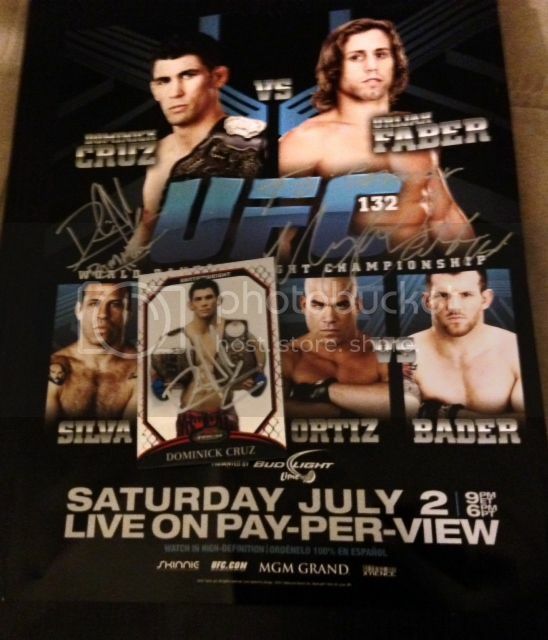 Im making solid progress on getting this poster signed as I only need 3 more fighter and two of them(Silva, Leben) are pretty good TTM signers. I really wish Bader wouldnt have used a dried up black sharpie to sign though as it dosent look as good as the silver. 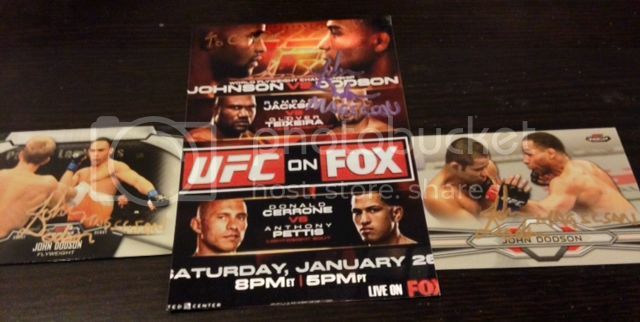 Still a nice success and this poster will probably be going out to wanderlei Silva next very soon. Very nice success from the long time MMA fighter. I have enjoyed watching him fight for a long time and I'm looking forward to his fight against James Te Huna. Unfortunately, the pen he used was kind of dried up so the signatures didn't turn out the best but it's a cool success nonetheless. He also inscribed The Great on a couple of cards which is appreciated as well as the cool photo he included.